Does Your Company Vehicle Represent Your Company? I had a pet peeve with my employees and the company trucks they drove. Keep them washed, keep the truck stocked and organized and not one paper is to sit on the dash inside the truck and they were to have their truck fueled up before you end the day. That is all I asked. I believe that was the bare bones basics. My company trucks represented how I do business. If I showed up with bald tires, fast food trash on my dash and an oil leak left in their driveway, wearing a rock band t-shirt, what does that say about how I run my company. It say’s this; Safety is not a concern, I don’t care about the mess I leave and who cares about you, the customer. Do I look like a professional? I had a person leak motor oil onto my pristine driveway and I said, “Do you realize that you leaked oil all over my driveway!” Their response, “Isn’t that what driveways are for?” I just stared into his uncaring, soulless eyes…. The First and Second Impression. You have heard about how important first impressions are. 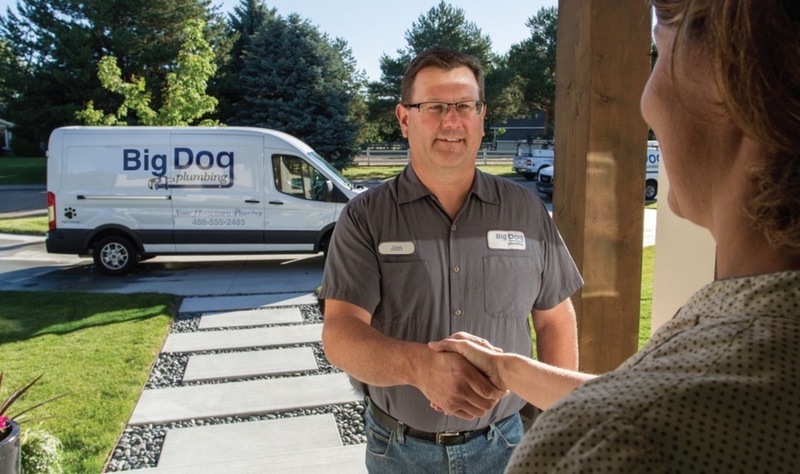 The customer seeing you drive up to the house in your vehicle is their first impression. Second impression is what you look like when you get out of your vehicle and so on. AND, you’re lucky enough that the customer called your company! Why make it any harder!! If you make the effort to keep a clean truck and maintain the vehicle, it will take care of you in more ways than one without you even knowing. First of all, what type of customer do you attract with an immaculate truck compared to a smoking, barely running old beater? High end customers? Customers that pay cash or that pay when you're done with the work no matter how much it is? If you want to get in the doors of high end customers, you have to play the part. This pic below is exactly how every job should appear. Vehicle in plain site, washed, well dressed tech with a smile. This is what every initial contact should look like. Final thoughts. Go the extra mile to keep a clean vehicle. Park on the street, maintain your vehicle, wash it at least every week and keep any trash off that dash. If you’re paying big bucks for advertising your company, it goes beyond the yellow pages or website. You need to show them the proof is in the pudding when you pull up to their house. Subscribe below to get more articles that come out twice a month regarding service industry standards, outspoken comments and things you won’t here about in general community round table meetings. Real life, real stories.